It's the most wonderful time of the year--the holiday season! 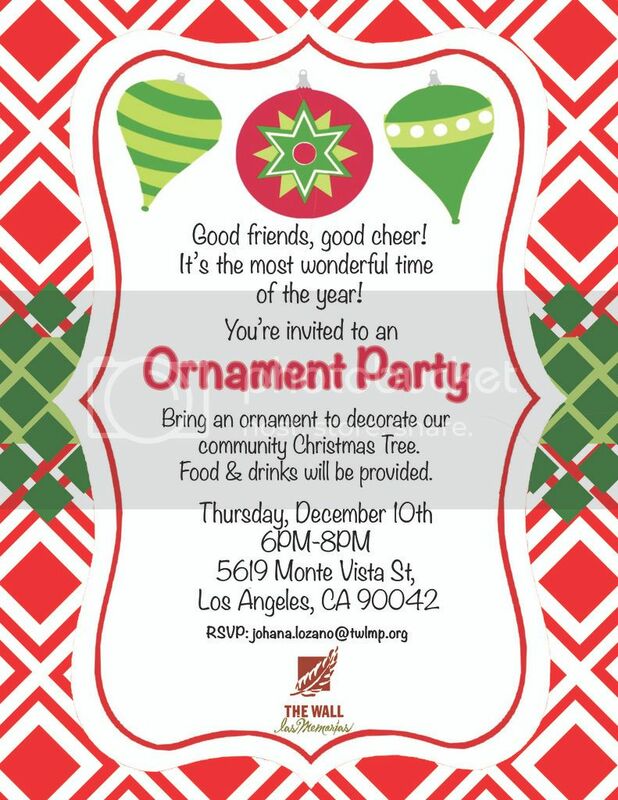 The Wall Las Memorias Project invites you & all of our friends to our Christmas Ornament Party on Thursday, December 10th from 6-8 pm at our Highland Park office. Come by for an evening of holiday fun and meet our friendly staff, enjoy holiday music & treats, and bring an ornament to decorate our community Christmas Tree! Light food & refreshments will be served...but if you want to bring a tasty treat to share, feel free to bring some along! PARKING: Event parking is available at the lot next door, located at intersection of Avenue 56 and Monte Vista St. Street parking will also be available throughout the neighborhood on Monte Vista St, as well as Avenues 57 & 56. To go green, take Metro Gold Line to the Highland Park Station (we're just 2 blocks northeast from the station).